Roles Minimum Male roles = 6. Minimum Female roles = 13. Minimum total with doubling = 26. Minimum total without doubling = 35. No chorus. Characters are a mix of adults and children, but all could be played by children. Music Complete set of original lyrics and musical arrangements based on traditional tunes supplied with the Producer's Copy of the script. Style Musical play set in an American High School (but could be played by younger children). Simple sets. Synopsis The High School budget needs to be cut. The drama club is under threat from the unsympathetic principal. Can the Drama Club save themselves by creating a production of The Wizard of Oz from scratch? Roles Minimum Male roles = 3. Minimum Female roles = 4. Minimum total with doubling = 9. Minimum total without doubling = 9. No chorus. Whilst some of the characters are nominally gendered, they are symbolic, so take this as guidance only! Style Short piece for young children, with an introduction to (largely the American sub-set of) Easter traditions. Synopsis The Easter animals led by rabbit Peter Cottontail present their account of the traditions surrounding Easter and their explanation of its meaning. Roles Minimum Male roles = 0. Minimum Female roles = 0. Minimum total with doubling = 15. Minimum total without doubling = 30. No chorus. Characters include nine fowl and an Easter bunny (offering plenty of opportunity for mask- or costume-making!) Beyond that, the cast is very flexible (basically written for a class-sized group). Music Suggestions for critter-themed songs are made in the Producer's copy of the script. 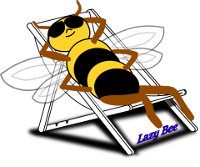 Lazy Bee Scripts does not supply any sheet music with this script. Style Comedy play for young children, with corny jokes and opportunities for songs and dances. Synopsis The Easter Bunny (or Funny Bunny) tries to help out poor Clumsy Chicken who has smashed all her eggs in a nasty fall and is facing the chop... well, the roasting dish. Other feathered friends flock around to help or hinder the effort with a few jokes and songs. Roles Minimum Male roles = 5. Minimum Female roles = 3. Minimum total with doubling = 25. Minimum total without doubling = 32. Chorus. Music The producer's copy of the script suggests the use of a couple of familiar hymns/songs. 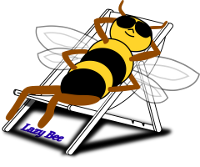 Lazy Bee Scripts does not supply any sheet music with this script. Style Simple version of the Easter story as a play for children. Multiple locations (following the story!) but no specific set requirments. Synopsis A classroom/church group rendition of the Easter Story from the arrival in Jerusalem to Mary's encounter with Jesus outside the tomb. Roles Minimum Male roles = 1. Minimum Female roles = 3. Minimum total with doubling = 8. Minimum total without doubling = 8. Chorus. Music Simple piano/vocal scores for four original songs are supplied with the Producer's Copy of the script. Style A fifteen-minute musical based on Ancient Greek myth. Synopsis A shoemaker and his wife are amazed to find that their work is being completed for them whilst they are asleep at night. An investigation follows! Roles Minimum Male roles = 3. Minimum Female roles = 4. Minimum total with doubling = 7. Minimum total without doubling = 42. No chorus. The characters are a mixture of adults and children of various ages, intended to be played either by that mixture or by youth theatre groups. Style A collection of eleven short plays. Basic sets, a few simple props. Synopsis The collection was commissioned for a Youth Theatre workshop. Each play is for four actors or fewer, playing a mixture of adults and children, and intended - as you might deduce from the title - to demonstrate emotions. The plays are not designed to be performed in any particular order.